A large portion of global food waste occurs when fresh produce goes bad before we have the opportunity to buy or consume it. Produce often rots on grocery store shelves or in our fridges and fruit bowls, due to the long distances that food travels in our far-reaching food system. There are solutions to this issue, such as buying local and only purchasing produce that you need, but in case that these techniques don’t work (i.e. shipping fresh produce to remote communities) science, as usual, is there to save the day. 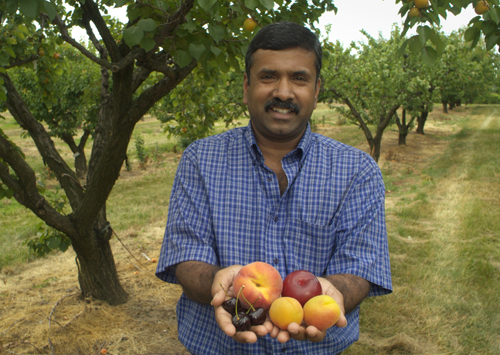 As a professor of plant science at the University of Guelph, Jay Subramanian understands all too well the swiftness with which picked produce can become inedible. Although there are currently a variety of protective coatings and waxes that are sprayed onto fruits and vegetables, Subramanian’s protective spray is innovative in its nanotechnology-based approach. The spray is made from hexanol, a natural component in plants which inhibits the enzyme that breaks down cell walls, causing fruits and vegetable to shrivel and rot. “Once the walls are protected, the cells are intact and so the whole fruit stays intact,”Subramanian said in an interview with CBC. The spray is perfectly safe for consumption and can be washed off. It can be applied as a spray one and two weeks before harvest, or the fruit can instead be dipped in a hexanol solution postharvest. The result? 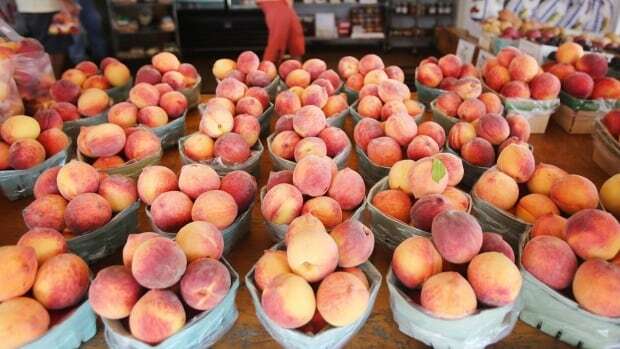 Fruit lasts up to 50% longer. According to Subramanian, bananas can last up to 40 days, mangos up to 23 and nectarines and peaches have an extended life of up to 10 days, on top of the usual one week they usually have to remain edible. Subramanian’s project was funded by Global Affairs Canada, through the International Development Program. It also worked with partners in India, Sri Lanka, Kenya, Tanzania and Trinidad and Tabago. The spray is still being reviewed in Canada for commercial use, but the project has hopes of going international in the next four years. Read more about the hexanol spray here. A recent study on an unprecedented approach to food preservation is making headlines across the globe. Published in Nature magazine, the article discusses the use of a silk protein-based coating that could prolong the shelf life of fruits and vegetables. Entirely edible, stable and biodegradable, the silk fibroin solution acts as a barrier to moisture and air, delaying the ripening time of produce. 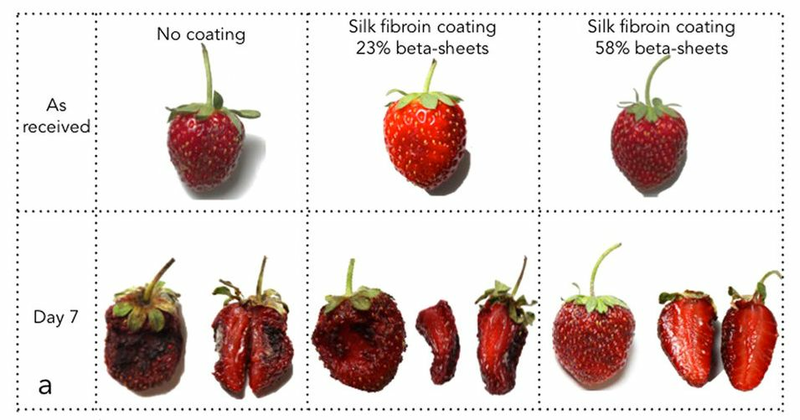 To test their theory, researchers dipped strawberries in two different concentrations of silk solution and monitored the fruit alongside a control group. Remarkably, the coated strawberries preserved their freshness and firmness better than those without a coating (over a 7-day period). A test was also conducted on bananas, which showed similarly promising results. This innovation has the potential to greatly reduce food waste and may aid in the struggle for global food security. Here in Canada, the silk coating could be beneficial to remote communities in the Northern reaches of the country by keeping produce fresh during transport. As many of these communities struggle with shockingly high food prices and a shortage of fresh fruits and vegetables, developments such as this silk coating may be an important tool in reducing food waste as well as food insecurity. Read more about the study in the original article here. While in Canada the biggest portion of food waste comes from the household level, in much of the developing world most waste occurs before it even reaches the market or household. Part of the reason for this is due to problems with storage. Grains and produce can be lost due to improper storage conditions causing spoilage, but also due to animals or insects. To combat insect pests, the Swiss company Vestergaard has created an innovative storage solution: the ZeroFly storage bag. The bag is polypropylene treated with an insecticide to stop insects from damaging agricultural products. While some may be hesitant about using an insecticidal bag,compared to other methods of preventing or killing pests, this bag leaves less pesticide residue while protecting the grain within from infestation. This product and similar innovations can potentially reduce losses for farmers, improving food security and decreasing food waste. Find out more about the ZeroFly storage bags from Vestergaard. Sometimes it’s all too easy to feel like an issue is too big or beyond ourselves. Environmental issues often fall into this as they can feel disconnected or beyond the scope of the individual consumer. I’m not trying to get people down, but rather to take heart in something I like about studying food waste. In this case, the huge environmental (and social, and economic) problem is very much one of which the average consumer is a part: that is the beauty of the issue. According to a report from last year, 47% of food waste in Canada is created at the household level, making it the largest sector, as can be seen in the chart. While I don’t mean to oversimplify (there are certainly structural changes which also need to occur), consumers do play a major role, as we can see from the fact that the majority of food waste occurs at the household level. The beauty of this is that we do have a great deal of power to change by altering our waste creation and disposal practices. Perhaps I’m more talking to myself, but I think sometimes we need the sense that a difference can be made. Because so much of the waste occurs in the home, changing household behaviour can have an enormous impact. Consumers can reduce the amount of waste they create by adopting proper food storage or careful meal planning, but consumers can also create demand for less wasteful products, or buy products close to their best before date in order to cut down on retail waste. Even just being aware of food waste has shown to cut down on it. I like to take heart in this, that individuals have so much power in this area. While consumers may feel overwhelmed by the need for systemic change, and it is important, I think it’s equally important to remember to start with the easy changes, including steps that de-normalize food waste. Food waste is complicated, but there are some areas of low hanging fruit, like starting with eating your leftovers and composting inevitable food scraps. The reality is that changing policy can make the food system more efficient, but that still won’t cut out food waste in homes, where so much of it occurs – that requires changes in consumer behaviour. And here’s where I think there’s so much potential: consumers have already been seen to produce less waste once they are conscious of it, and with the growing attention to our food and now the waste associated with it, I feel more confident that food waste is manageable and that we will start to see changes. 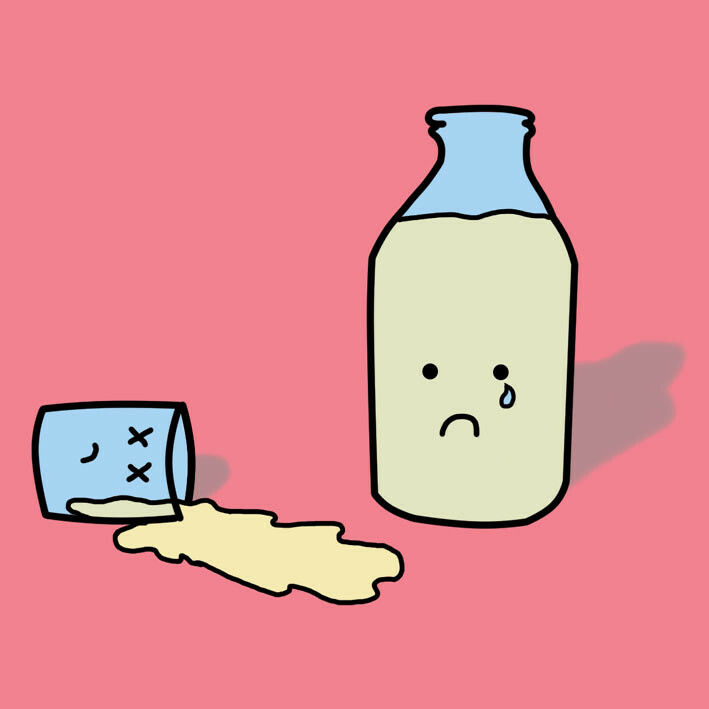 Whether or not you are in favor of the supply-managed dairy system in Ontario, when 800,000 litres of milk gets dumped, you know that something just isn’t quite right. The Globe and Mail’s article blew this wide open and revealed that the Dairy Farmers of Ontario, when faced with a greater demand for higher fat dairy products, were left with a great deal of skim milk, which was then periodically disposed. This has amounted to 800,000 litres, just since the end of May. The article places heavy blame on the supply-managed market for such ‘chronic overproduction.’ I would hesitate to place the blame so heavily on the market system, as overproduction happens in an open market as well, but rather on the fact that this type of loss is considered acceptable because it is still profitable. Even if producers refuse to sell skim milk at a reduced price, and facilities dehydrating skim milk into powder are full, there are still alternatives to dumping such as donating, or at the very least feeding to animals. What is scandalous is that while the dairy board may feel like this is an affordable loss since farmers are making money from cream and butter, it is still a loss of resources, energy, time, and money that went into producing the dairy. Clearly there is a problem with the system if this sort of waste is acceptable to the industry. What is reassuring, however, is the public response. People have reacted with shock and anger to the disposal of this quantity of milk, which shows a level of concern that hopefully can impact producers to reconsider their practices and create a more efficient system.